The colorful story behind this gingerbread house was I decided to enter a local gingerbread contest, at my mother's urging might I add, in fact it was her idea. 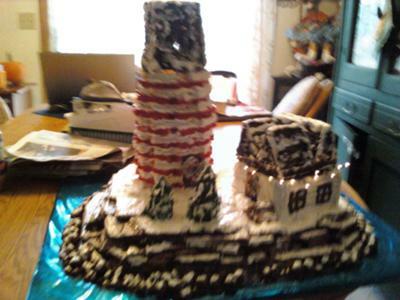 Anyway, I spent weeks working on it and was very excited about it, there were lights in the lighthouse, on the house, detailed colored frosting to highlight and lowlight the gram cracker cliffs, cinnamon pieces to make a cute little wood pile, and handmade wreaths for the doors... Unfortunately my delightful mother got the dates of the contest mixed up, and instead of it being at 9am on Sunday it was actually 9am on Saturday. Yeah it was not as funny then as it is now. But, I am doing it again this year... however, I'm in charge of remembering the dates this time. What a DRAG about the date mix up! I cant imagine! Ive made houses for competition for the last 8-9 yrs and its alot of work! In fact I made a lighthouse last year too. Mark your calendar this year and good luck!